Information The River John Public Library & Innovation Center is located just off of Route 6, Sunrise Trail (by the bridge, on West Branch Road just past the pharmacy) and is located across from the Lions Club Hall and Bissell Park (with the community boat launch/wharf). River John Public Library is one of seven branches in our regional library system. The River John Library is a wireless hotspot (WIFI) with access to high-speed Internet. The Library is also host to the River John Community Web Site at www.riverjohn.com. Visit and see what the community has to offer! Programming, Reader's advisory, reference, inter-library loan, Internet access with free tutoring, public computer workstations, laptop, FAX machine & scanner, photocopier, printer, Makerspace, 3D printer, laminator, digital camera, projector and screens, digital-vinyl recorder, SKYPE, GPS, family play packs and Nordic walking poles. Instructional tours available upon request. A 24-hour book drop is available outside the Library. 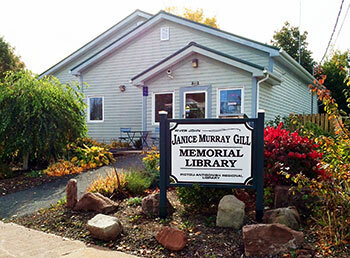 The Pictou-Antigonish Regional Library Board will provide non-profit groups with meeting space free of charge in the Library Program Room, when not in use for library activities. These meetings are to be of a non-fund raising, non-revenue generating nature. The Board reserves the right to accept or reject requests for the use of meeting space. For more information, please contact the River John Library (902-351-2599). The Community Room, and Community office are available for reservations. Facility Rental: In addition to the regular library services, this branch features a fully equipped boardroom, an outreach office (both of which may be reserved), and a computer training area . For more information, please contact the Library (902-351-2599). ** If you wish to use the Library for Internet Access beyond regular library hours, or for any other computing needs or training, please telephone the Library and arrangements may be made. If you wish to use the Library for Internet Access beyond these hours, or for any other computing needs or training, please telephone the Library and arrangements may be made.